In my previous post I talked about the two basic different approaches that you can use to start applying Enterprise Architecture. This post is describing another option called the Middle Out. 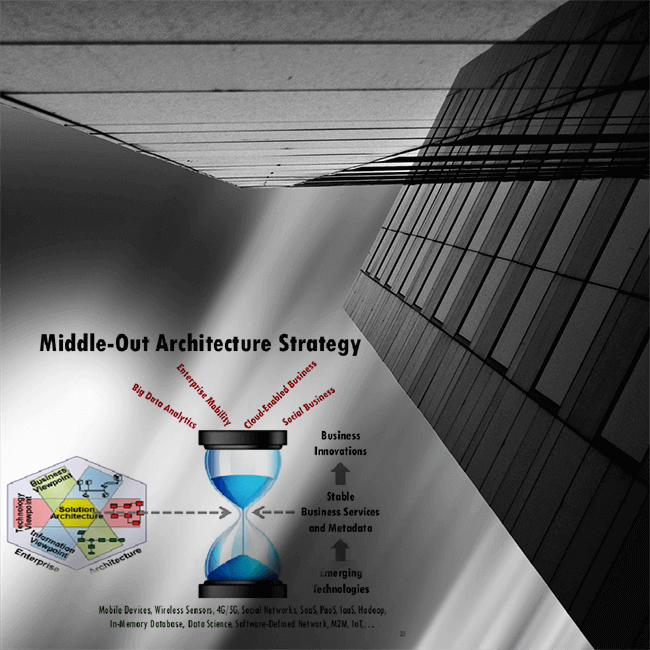 The middle out is a very most common approach getting started with Enterprise Architecture. One of the reasons is that this middle layer is already shared by both business and technology people already. I am talking about the Application layer. With the Middle Out you focus on the strategic planning value of EA but also on the operational insights. So what are the key ingredients you need to look for to assess if this approach is a good choice? •	One of early wins outcomes of a middle out approach is an application inventory (or application catalog in TOGAF terminology). Would this be of value to your organization? As you can see the business driver for Middle Out is more IT driven but not operational IT more business planning IT. A subtle but important distinction as the bottom up approach tailor to the operational IT side. So now that we covered the 3 basic different approach the killer conclusion comes. I started with describing the different options and giving insight to assess if a certain option is feasible. In my personal experience however the reality is that EA implementations need to leverage multiple approach simultaneously. At least 2 but often all 3 are applied during EA practice setup and built out. 1. Apply Top Down when working on developing technology strategies and roadmaps to enable certain business strategies, to core of what TOGAF ADM is all about. 2. Apply Bottom Up to be able to define your architecture standards. The hardest part here is where you draw the line, how far down the rabbit hole of standards do you want to go? My personal experience is stay away from the physical level and also the specific version level. I believe a CMDB is much better suited for those details. 3. Apply Middle Out as it is my strong belief that Application Portfolio Management is a MUST for EA. So create that application inventory, start rationalizing etc. From an enterprise architecture tools perspective the Middle Out approach requires the tool to include portfolio management functionality. I am not referring to project/initiative portfolio management but an ability for you to manage your portfolio architecture building blocks. A single place where you can access a 360 view of each application component, view the relationships it has with other components and extended attributes you want to record. Now one thing you might have noticed is that I haven’t talked a lot about Information, well that is because I am dedicating a specific post on EA and Information. Hope you like this read and it is helpful in your EA journey.